The start to the New Year in 2018 was with a bang, and with an extraordinary aircraft. The release of FlyJSim's Boeing 737-200 TwinJet to version v3 was far more significant than most X-Plane simulation users realised. The aircraft was expected just before Christmas 2017, as per the usual release period from FlyJSim, instead the aircraft release came into the New Year which in many ways was a far more better time to release without the distractions of the Christmas Holiday period. So why was the aircraft so significant? It was to a point the first of the new-generation of X-Plane11 aircraft, as it used all the features and tuning that came with the X-Plane11 simulator version. You thinking would be, "well we had X-Plane11 aircraft all last year, so it is not that much different or special", but it is in that most of the releases or mostly the upgrades that came out last year were mostly conversions of existing aircraft and to bring them up to the X-Plane11 level of compatibility, and although on the surface that also seems the same approach from FlyJSim, it is in reality a very different aspect in the fact the aircraft was created to include the X-Plane11 features from the ground up after X-Plane11 went final and not converted. Yes a lot of the original v2 design's were used, but even those were reconfigured to the X-Plane11 specifications. So the FJS 737 TwinJet is the first true X-Plane11 aircraft, in other words it is the future of X-Plane11 aircraft airline design. At first sight or flying you then knew this was something different, an even more deeper immersion of simulation flying. I will make the comment here that X-plane11 changes the basics on the way you absorb a new design. In the past any aircraft could and would be easily summed up within a few flights and its visual clues. X-Plane11 really does change all of that, and I realised that factor once the simulator had gone final. Flying aircraft is now a very deep subliminal activity, in the feel and the way you interact with each machine now is very, very different and you have to peel back the layers to get down to the core of the aircraft, the words "it comes to you" is based on the real world feel of the way we interact with our machines and how their personalities come out with time to interact with their deeper being. That aspect plus the really now extremely deep systems noted as "study" aircraft, means these aircraft are not now a simple circuit around the airport and "you get it" factor, it now goes far more deeper than that. It also buries the "First Impressions" factor, as you have to go a far more longer way around and spend a lot of time to get down to real aspects of the aircraft, pro reviewers do have the experience factor on their side, but looking over an aircraft like the FJS Boeing 737 v3 TwinJet is now like looking straight up the side of glacial mountain and wondering how to climb it. So this splits users hard into two separate camps. The ones who are willing to spend the time and work through the constant procedures to get to simulation nirvana, and yes the work is worth the rewards. But also the other camp that in letting the developer give them a hand in filling in a lot of blanks and short cutting systems to give them the feel and fun but without the dread of the depth, in other words "Start up and fly". But even the second approach of the helping hand, can be also be a far deeper simulation than it was only a few years ago. This was the time of the Aerosoft ATR 72-500 with most of the systems blanked off, and simple simulation was the go, even the most basic aircraft released today make that aircraft feel like the toy it was. The amount of work now required to set up the aircraft (and you haven't seen nothing yet folks) is substantial, in almost real life programming and loading factors. This is now a period required of even up to twenty minutes before you fly, if you want the FMC data to perform correctly and to be realistic then the effort is required, but it adds in a lot to a quick flight (to somewhere) and adds on time to any serious simulation. The split is certainly required so don't also mock the "basic" aircraft approach. To experienced simulation flyers these aircraft are just that to their minds in being "Simplistic", but remember you were once a simplistic flyer, the novice, the "where is that?" idiot. It can take years to really, really fly today's excellent simulation aircraft and don't throw at me the "Oh X-Plane's not still a deep simulation in any form, because of this or that", because it isn't and you are really working far harder in there now than ever lately and certainly far more than in those ATR 72-500 days. The release of the Boeing 737 TwinJet from FlyJSim also came with a warning.... "Make sure you have flown this aircraft a lot of times before doing a review", which was very good advice, not great for getting a review out to the waiting hungry hoards that wanted to get their hands "On it". But still good advice and I passed it on in the review of the aircraft. In other words don't go blabbing out on the forums unless you understand what you are ACTUALLY talking about, because as noted these so called "First Impressions" just don't work anymore. In this day and age even the experts can be caught out and badly by not fully understanding the aircraft that is presented to them. For the record it took me seven goes or landings to land this v3 Boeing 737 TwinJet from FJS in the absolute perfect manner, and in one landing it was actually quite a mess? But that highlights the subtle changes and differences you are faced with now of these very different XP11 machines and in the way you are required access them, if your not feeling that, then you are not doing it right. The FJS 737 TwinJet delivered also another masterstroke. It was in a strange way the first of what you would call a complete aircraft. Yes we have had aircraft cabins before, but not to sheer immersion of how complete this aircraft was from the cockpit and right down to rear of the cabin. In most aircraft of this genre the cabin is an afterthought, a space to be filled in... not really that important in the whole scheme of things. But here you were in the cabin, in the seats and if you moved around (and in flight) you were as in the moment as flying the aircraft from the front seat. It felt "Complete" if what complete is? but you knew it was a new era of X-Plane simulation, of what is to come and where in the high standard of the new line we are now flying in. The FJS B732 will of course in few years appear nostalgically to seen be in the same light as the JRollon CRJ-200, but in the current time is the FJS B732 best aircraft in X-Plane right now? and in that complete sense, personally I think so. On a side note. The FlyJSIm Boeing 737-200 v3 was also a slightly proud occasion. The aircraft was not done by a large development team, yes there is outside elements in the aircraft, but mostly it was mostly the work of one developer in Jack Skieczius. Jack is an X-Plane original and to create an aircraft of this extremely high standard is a reason to laud his efforts, not only in the design of the work but also advancing X-Plane to another level. In that vein I have some very bad news for you. In 2018 it is going to be an expensive year, and your hands won't be out of your e-commerece site all year. 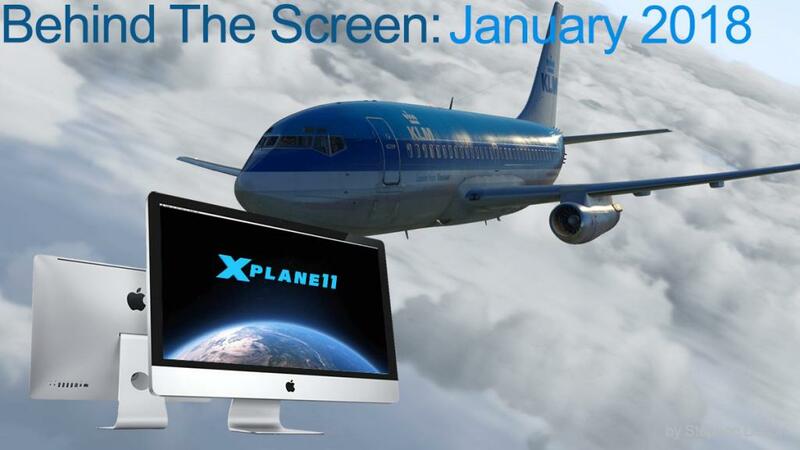 In 2017 with the X-Plane11 introduction, most of the releases were mostly the reconfiguration of current aircraft and airports to the X-Plane11 specifications, and in most cases you had to (re)pay to access the new X-Plane11 version. This clouded the market in the fact that your hands were always in your electric wallet to get back the same aircraft (but still better) that you had the year before in X-Plane10. Many opted out and just stayed in X-Plane10, but that was not a great idea at all as the changeover or cost has to be faced one day, and every day you stay out then the more expensive the crossover will be for you. But back to the bad news... So all of the projects that were ongoing, they were then put on hold to clear up the upgrades to X-Plane11 because users wanted to use them in the new simulator. Once the decks were cleared it was back to the grind of completing the shelved projects for release, and you guessed it right for in... 2018. So expect a huge amount of new projects being released this year, a bonanza you would say, but also a lot of the projects that are going to released in a short and expensive time. They are already coming thick and fast, and the year hasn't even really started yet, so start saving for a bumper Easter period, as it is going to get really expensive folks. Two aircraft on the short list are both Airbuses, in the FlightFactor/SteptoSky Airbus A320 Ultimate and the ToLiSs Airbus A319. Both are coming very soon and both (as in both aircraft) are going to stretch your budgets. In some areas they are remarkably similar and mostly in the FMC programming and use, this is Airbus after all and their philosophy of "Fly one and fly them all" and that is very relevant here with both these aircraft. But they are fundamentally different as well but not in the way you think they would be. You are going to be happy flying either aircraft, because they both deliver great experiences, but the choice is going to be more on routes than actual aircraft differences. The A320U is better for this and the A319 is better for that, "eeny meeny miny moe" and that creates the problem, purchase one aircraft and you will certainly want the other one. Laminar Research has put out its first betas of it's VR (Virtual Reality) integration with X-Plane. Your thought's would be that X-PlaneReviews have not mentioned or reviewed VR in X-Plane much, but that is not of because we are not aware of VR or not previewing the technology. I have used VR and mostly in a helicopter scenario and will note it is an amazing experience. But and here is the "but" question... VR is still very new technology and there is that high cost factor in that currently Laminar at this point only supports the most expensive headsets of Oculus rift and VIVE. Overall it is the gap between the current and the future VR manipulation of the simulator in X-Plane that is the barrier. The advent of hand VR controllers are very good, but there is still that wave in the air feel of no physical contact. For those of you that haven't yet experienced the VR feeling, it is the immersion in a different 3d world, but it is also like standing in a dark room with your hands out not touching anything and your hands can and do go through walls, almost ghost like. The next phase as noted by Ben Supnic is to give you access to your current add-on tools in your joystick, throttle and keyboard in a more physical aspect that will create a better interactivity with the simulator. In my case I was using VR in a frame that replicated the Helicopter's controls and the immersion factor in that sense is very good for the flying aspect, but with the interaction with the finer aircraft controls even in as something simple as turning on the aircraft's landing lights was problematic, you can't hold a Collective and a Cyclic and then a VR handset all of the same time in a physical sense, and that physical feel and touch is very important when flying helicopters. There was another aspect that was an issue as well, the current VR headsets are extremely hot and tiring... with twenty minutes of flying I was already seriously sweating like nothing else and was simply buggered, and I don't really face the prospect of using the VR headsets for longer periods of time like 3 to 4 hours, which is a standard simulation flight. But one point I will make is that while I was waiting my turn to fly in the VR mode, a real helicopter pilot was putting the system through its paces, and he was extremely interesting to watch at work, a lot of movement in the seat and very minute movements on the controls, but when I copied his flying style (interesting to say the least) it was a very much more easier but a far more involved simulation, it made sitting in front of a computer screen quite boring after. So on that note VR is or will be a very exciting and very immersive next step in flying on computers. In five or ten years it will be as normal as what you do now, but you will be really in there and intimately flying the aircraft and not just operating it from a slight distance, a realism you can only dream of only a few years ago will be reality, but at this point VR for X-Plane is still in it's baby steps... but it will quickly grow and mature. I am quite steadfast when it comes to plugins, my philosophy is that the less plugins in the plugin folder the better as they can compete with each other or mess up the basics of making X-Plane run as efficiently as it can. My biggest hate is the fact when the simulation is stuttering or pausing for something that is effectively a barrier and not an enhancement to the experience. But we all need plugins, as they can and do enhance simulation in ways that are beyond the boundaries of Laminar Research's basic approach. Once found (and tested), some plugins become default that I will defend with my life, so adding or changing plugins is a big deal to me. Take the pushback... I was a great fan of JARDesign's iTow or Tugmaster Deluxe. But after years of virtually no development or upgrades it became a bit of a pain to use on all aircraft. Then I switched to the X-Plane11 native pushback, which is actually very good, now there is "Stop" button. But the native pushback has one fault... call the pushback and then just sit there waiting forever for it to arrive? I have sat a full ten minutes waiting for that damn truck to arrive, very realistic, but "hey, I have a flight to run, and airline time is money!". I tried the BetterPushback plugin in August last year, and to a point it wasn't very impressive as it was at the time quite buggy. But the above FJS Boeing 737 TwinJet actually uses the plugin as part of its feature set and so I redownloaded and tried it. It is excellent, but still has a few quirks in the fact the setting of the initial pushback alignment is still a little buggy, and you have to be very careful setting it up correctly... but overall it works extremely well with every aircraft I have currently used it with, and so it comes highly recommended. My New Year started off with whimper and not a bang, another bout of flu sent me to the doctor's and a week in bed. This did set my agenda back a week, and a lot of catching up to do. Most of what I wanted to cover has been done, but a few are still on the list, but will get around to them soon. As usual great new releases can also ruin any well made plans as... X-Plane stops for no one or anything.